The Manual Import method is designed to import individual videos that do not come from your main day to day camera. This includes videos that you might have received by email, thumb drive, cd / dvd, phone, downloaded from the web or extracted from Youtube etc. 1) Use the Open Video button (item 6) to find and open your video. Valid videos include AVI, MOV, MTS, WMV, MPG and MP4 videos. 2) Use the Play buttons (item 12) or Scroll bar (item 17) to scroll where you want the imported video to start and click the Set Start Point button (item 13). 3) Use the Play buttons (item 12) or Scroll bar (item 17) to scroll where you want the imported video to end and click the Set End Point button (item 13). 4) Change the Student name if needed (item 3) and / or click to add the Edge filter (item 9) if desired. 5) Click the "Save New Video" button to import the video into SportsCAD (item 15). Note: If the video appears jerky during frame by frame analysis, or if it takes 2 clicks to advance one frame of video, see how to fix it here. Click the Change button to change between the 5 different Capture modes. Click the Change button to select the student that you want to capture. This is what the video name will be for the current video. Click the Change button to manually type in a name, or use the Camera Angle buttons (item 4) to select an angle. Select the camera angle that matches the current video. The Display Window will keep you informed of your progress during the import. Use this button to open the video that you want to import. This is detailed information about the video that you have selected to import. If you know that your video is interlaced (example is 720i or 1080i), check this box. If unknown, leave this box unchecked as you can always select to display the imported video in interlaced mode later. Check this box to enhance the edges of the video. In many cases this is a better option for your imports as it creates a more focused video. This window will display the video you selected for import. The Progress Bar will show you the progress of your capture when you click the Save New Video button. Play, Pause and Rewind the video you selected for import. You can trim unwanted footage from the beginning of the video before you save. 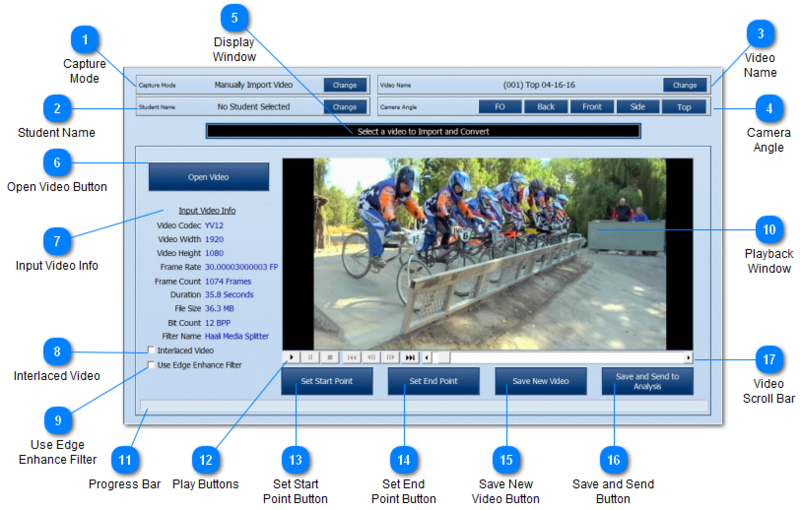 Click the Set Start Point button to select a new starting position for the video. You can trim unwanted footage from the end of the video before you save. Click the Set End Point button to select a new end position for the video. Click the Save New Video button to import the selected video to your computer for use in the program. This button will import the video and send it to the Analysis section in one step! Use the Video Scroll Bar to scroll through the current video.